Charles Severance called the sound of fired bullets "sweet music" and "very effective," according to a court document filed by prosecutors. They've revealed many new details about their case against Severance, a suspect in the murders of three prominent Alexandria community members. The killings may be tied to a custody dispute over Severance's child, the new court documents suggest. Prosecutors also say that Severance's former girlfriend told authorities she felt he manipulated her into buying guns, and that he appears "intelligent, well-read, calculating, and focused on violence" in many writings obtained by investigators. Severance is facing 10 charges in the deaths of Nancy Dunning, Ronald Kirby and Ruthanne Lodato, whose murders spanned more than a decade and terrified an Alexandria community, making residents afraid to open their own doors. Severance had a "disturbing fascination" with the make and model of firearm used in all three killings, claims a court document filed Thursday. "The defendant [in a writing] calls the make and model of firearm 'beautiful, tiny, and deadly'," a court document said. "...The defendant stated that the ammunition, when fired, is 'sweet music and very, very effective'." Prosecutors suggest the killings may be tied to a custody dispute between Severance and the mother of his child. In late 1990s and early 2000s, Severance lived in Alexandria, within a mile of where all three victims would be killed. During this time, he had a child with his then-girlfriend, but his parental rights were later terminated. Authorities say Severance was "extremely angry" over this and continued to fight the ruling as late as 2011. Investigators have found a large number of Severance's writings which "depict a man who is exceptionally angry not just at the Alexandria court system, but at what he terms 'status quo utopian elites'," according to the court document. All three victims were considered prominent community members; among them, Dunning was a real estate agent known as the "queen" of her neighborhood. She was also married to then-Alexandria Sheriff Jim Dunning. Severance's defense attorney has submitted a motion to try Dunning's murder separately from that of Kirby's and Lodato's. On Thursday, prosecutors submitted an opposition to the request, arguing that the murders are connected. All three killings resemble assassinations, the court document says. In all three cases, the killer came to the front door, the victims were shot in their upper bodies, and the shooter left quickly without taking anything. All three murders occurred between 11 and 11:30 a.m. on a weekday, within a one-mile radius of each other. The .22-caliber ammunition used in all three murders is "extremely similar and distinctive" and "is rarely used in criminal offenses," the document said. Two experts say they've only seen this combination of make, model and caliber used in these three murders. However, the bullets recovered from the crime scenes did not appear to be fired from the same gun, although three very similar firearms were used, the document alleges. The documents also allude to a surveillance image released after Dunning's murder in 2003. 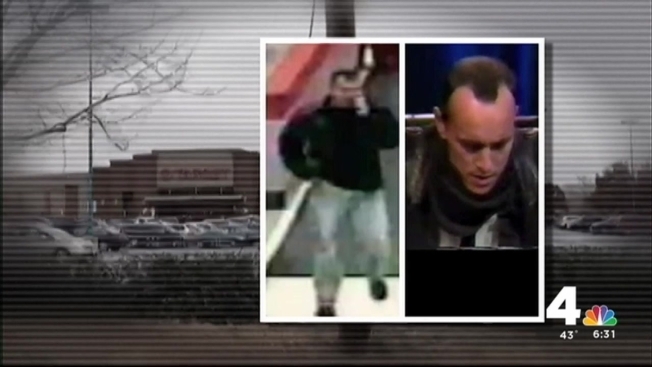 The image shows a man who apparently followed Dunning into a Target store at the Potomac Yards shopping center shortly before she was murdered Dec. 5, 2003. Prosecutors say Severance appears "strikingly similar" to the person shown in that image. The murders of Kirby and Lodato occurred approximately a decade later, in November 2013 and February 2014. Another woman was home with Lodato at the time of the shooting. She was also shot, but recovered and was able to provide police with a description of the gunman. Severance was initially arrested in March on a charge of being a felon in possession of a firearm. His lawyer has argued that the guns in question belonged to his then-girlfriend, Linda Robra. Robra told prosecutors she owned two .38-caliber weapons when Severance moved into Robra's Ashburn, Virginia townhouse about three years ago, after they began dating, and that she purchased two .22s at Severance's urging. A court document filed Thursday said Robra told police she later realized that she was "manipulated by the defendant" into buying the guns. Severance moved out of their home March 10, shortly after he learned an Alexandria police detective wanted to talk to him, Robra said. When the house was searched two days later, the .22s were missing. At a hearing in June, Robra testified she didn't think Severance had anything to do with the murders. Both the commonwealth's attorney and Severance's defense attorney declined to comment. Severance is scheduled to go on trial Oct. 5, 2015.